☑️ THE MUST-HAVE SAFE CHARGING TECH GADGET. Technology is becoming more advanced in this century. Back in time, wireless charging was something unimaginable. Now it exists everywhere in our daily life. It’s simple to set up. You will see that the charging speed of the mobile power bank is not bad compared to the traditional charging method. Certified by FCC, CE and RoHS for quality and safety. Wireless Charge Universal Compatibility: Fast wireless charge mode work only with Samsung Galaxy S8, S8 Plus, S7 Edge, S7, S6 Edge Plus, Note 8 and Note 5; For iPhone 8, 8 Plus, iPhone X, Galaxy S6 Edge, S6 and Nokia 9, Huawei Mate 10, Nexus 4, 5, Lumia 920 and other Qi-Enabled devices will wireless charge at 5W standard mode. - Multi-protect system enables more safe charging. - Supports wired charge 1 device and 1 wireless charge simultaneously. - Hidden 4 leds charging Indicators show the level of charge. "2.1A USB output and 1.5A wireless output automatically identify and deliver the fastest speed to your phones. 2.1A input make sure about 5 hours time to fully charge 10000mah capacity. ☑️ MULTIPLE AND SIMULTANEOUS USERS. Did you always wished there was a power bank that can charge either iPhone, Android with cable but also wirelessly? This is the one that YOU need. You will also be able to use the battery as a wireless phone charging pad while it's charging itself! This qi fast charger works really well for you and your husband and the best thing is that you both can charge your devices at the same time. ☑️ CORD-FREE MOBILE POWER WORKS GREAT FOR TRAVELLING. 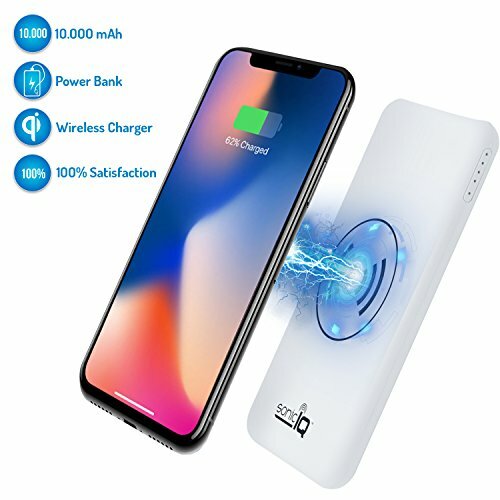 This QI battery charger is a combination of fast wireless charger pad and portable power bank, built-in high-power QI wireless charging transmitter and a high capacity 10000mAh rechargeable battery. It's great for on the go charging when you can set your phone down somewhere, if you want to charge wirelessly or have the pack in your pocket and charge your phone with a wire in the other pocket. ☑️ LIGHT WEIGHT. There are many things that you will like about this portable power bank. One, its size is so convenient and easy to put it in your carry hand bag. Second, its power content can last really long and can fully charge your iPhone X from 1% to fully charge a few times in a day. There is no doubt that this 10000 mAh wireless power bank charger can make your life easier. ☑️ THE MUST-HAVE SAFE CHARGING TECH GADGET. Technology is becoming more advanced in this century. Back in time, wireless charging was something unimaginable. Now it exists everywhere in our daily life. It's simple to set up. You will see that the charging speed of the mobile power bank is not bad compared to the traditional charging method. Certified by FCC, CE and RoHS for quality and safety.